The vast and low populated extension of the Russian territory was allways an ideal place to perform stratospheric flights, specially the long duration ones. Due to the closed nature of the regime of the Soviet Era it's hard to obtain information about the several facilities for such activities, mainly because most of them fall under the military umbrella. Nevertheless in such cases on which the activity with balloons was performed under strictly scientific domain there is another barrier: the lack of information on these activities. This is the case with the balloon activity carried out by several scientific institutes from the Kamchatka peninsula in the eastern end of the giant Russian landmass. The launches started to be done from there in 1973 under a initiative of the Pushkov Institute of Terrestrial Magnetism, Ionosphere and Radio Wave Propagation of Russian Academy of Sciences to study the Earth's magnetic propierties first by mean of balloon-borne flux-gates magnetometers and later with more complex instruments. These balloon flights were already being performed from the Volks Balloon facility in the Saratov region (close to the Volga river) since 1970, under operation of Izmiran. We had not information about the exact location of the Kamchatka balloon launch site, the only certainity is that the terrain belongs to the Lebedev Physical Institute also from the Russian Academy of Sciences. But Thanks to the picture that can be seen at left -which we found in a Russian publication- we managed to get a clue on the possible location. After some research we identified the mountain showed in the background of the image as the Kliuchevskoi, one of the most actives volcanoes of the region, so probably the base is located close to the little village of Kliuchi the nearest human settlment in the region. The balloons launched there followed a flight path towards the west in a more or less parabolic line, crossing the central part of the Russian Federation in a lapse of 5 to 7 days. When the aerostats reach the neighborhoods of the Volga river, the payload is separated from the balloon and recovered. In the period between 1973 and 1986 near twenty flights were performed from there, mainly for magnetospheric research. 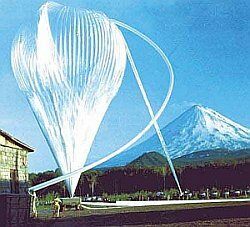 In 1995, a cooperative initiative of Japanese and Russian scientists created the RUNJOB project (RUssia-Nippon JOint Balloon program) that had by main objective the observation of the cosmic rays using emulsion chambers onboard stratospheric balloons. Taking account of the long exposure time needed, the long duration of the balloon flights from Kamtchatka was the best suitable for this project. A total of four campaigns were performed each summer in 1995, 1996, 1997 and 1999. After the closing of the RUNJOB effort, other scarcely balloon missions were performed carrying large flight trains of magnetic sensors which were reeled down in flight at different altitudes. The last one of these flights took place in 2005. 7/16/1997 3 h RUNJOB VII (RUssia-Nippon JOint Balloon program) Failure of the balloon after three hours aloft.